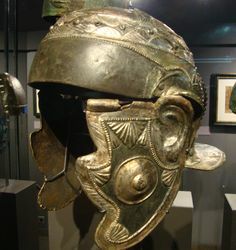 A Draconarius of the Late Roman period with a Persian-origin type of helmet, in a restoration by the British Historical Association Comitatus (Draco made by the German artisan Stefan Jaroschinski). He is a standard-bearer, bearing the Sarmatian standard of the Dragon, adopted by the Romans as well. During the Late Imperial period, the cavalry gradually became the main Weapon of the Roman army supplanting the legions, the glory of Rome. 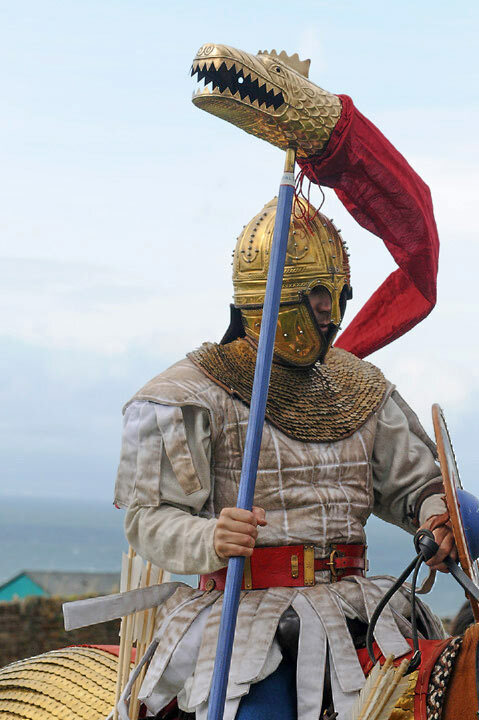 This development was due to the influence of the Iranian peoples (Sarmatians and Persians) and especially to the Roman need to confront the enemies who had a strong cavalry which could defeat the legions (Sarmatians, Sassanids, Goths, Huns). 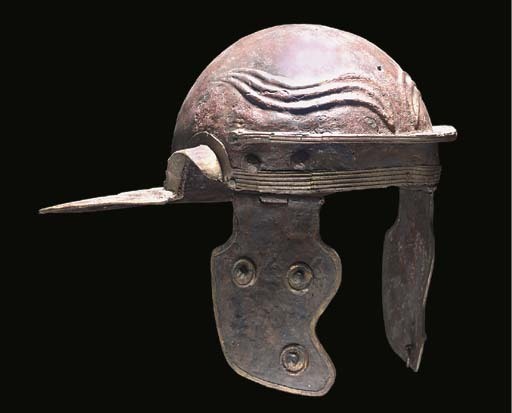 The Roman cavalry helmets of the period belonged to the following four major groups. 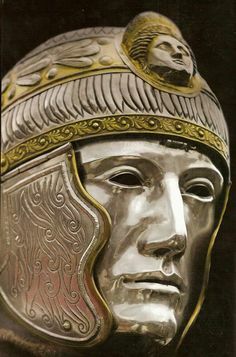 Gallo-Roman ceremonial helmet with visor (www.romancoins.info). This group of helmets came from evolution of the old Gallo-Roman type of the Middle Empire, the classic type of the legionnaires. It was adopted also by the cavalry during the Late Roman period. However, the use of this group gradually became limited until it disappeared in the Eastern Empire until around 500 A.D. (while the Western Empire had ceased to exist since 476). 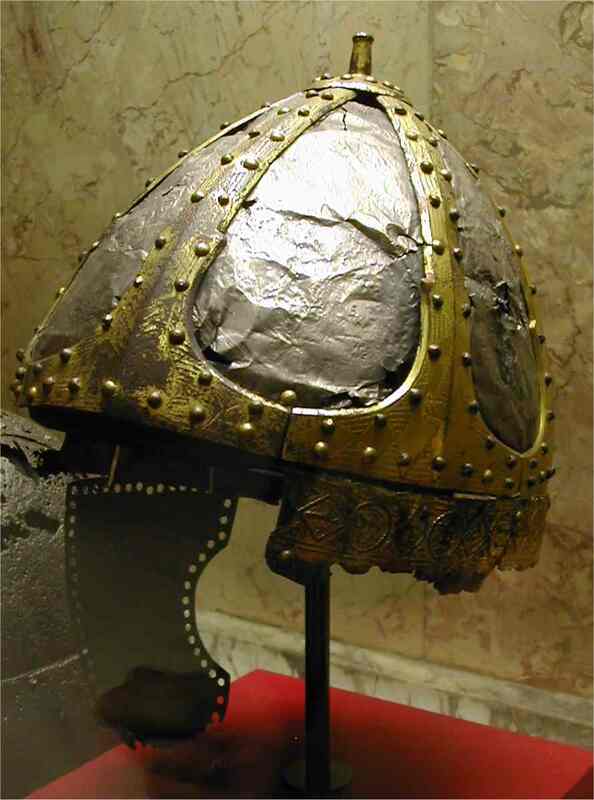 The spangenhelm group, of Sarmatian origins, became popular in both Romans and barbarians because of its cheap cost of construction and the effective protection that offered. Its construction was simple, made of metal fragments which were bound tightly together. Especially towards the end of the Western Empire, it rather became the most popular group. This group was used even more frequently by the Gothic and Sarmatian peoples. Another popular group of helmets which was characterized by large cheek-protectors and a strong backing in the eyebrow area. Sometimes it is considered to be of Persian origin (this is also my opinion) although there are objections to this view. 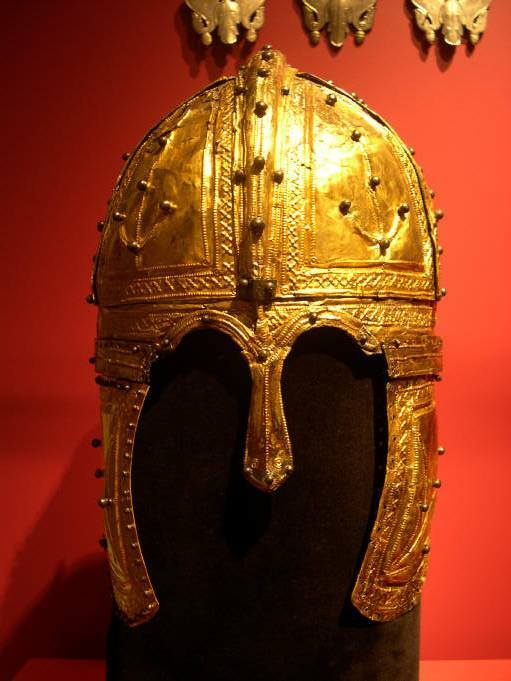 This helmet is usually considered to be a new variation of the Late Roman type of the ancient Attic-Athenian type, a variation which appeared in the Roman East since the 4th century AD when the turn in the Greek-Hellenistic past started in all its forms, and ultimately led to the evolution of the East into the Byzantine Empire. The use of this group continued until the 7th century. The Attic-Athenian helmet which was invented in Athens in the 5th century BC and became popular in Italy and Rome, had not ceased to be used by the Romans, but by the 1st cent. BC it was used only by the senior officers, including the consul and then the emperor. Besides these main groups of helmets, there were some more which were used rather rarely. The barbarians of Europe were using almost the same types. The Sassanid Persians were using their own types (similar to the aforementioned Persian group) and some other Asiatic ones. Finally, I must point out that two of the four basic types above are of Iranian origin (Sarmatian and probably Persian), another evidence of the strong military influence of the Iranian peoples on the Late Roman army. καλησπέρα φίλε. Να υποθέσω ότι ο ανατολικής προελεύσεως εξοπλισμός διαδόθηκε με την αύξηση των auxilia? στο Στρασβούργο (νομίζω), Ιουλιανού στρατηγούντος, ο Ρωμαϊκός στρατός έβγαλε την ίδια πολεμική κραυγή με τους βάρβαρους αντιπάλους του. Αυτό, σκέφθηκα, μπορεί να ίσχυε για τον εξοπλισμό επίσης. Γενικά οι λεγεώνες είχαν ζήτημα απέναντι σε βαρύ ιππικό. Στην Μαγνησία έβγαλαν λάθος συμπέρασμα για την αντοχή τους. Συμφωνώ με την παρατήρηση για την προέλευση των auxilia. Εξάλλου οι βαρβαρικές επελάσεις από ανατολικά ξεκινούσαν. If you had asked permission to use the picture from my website, or simply read the subscript, you would have realised that the top picture on this page (the Late Roman draconarius) was neither a restoration by Fectio or for Fectio. Although we (Fectio) have a similar draco, this one was made by the German artisan Stefan Jaroschinski for the British late Roman cavalry group Comitatus, whose briljant cavalryman is holding it. Credit where credit’s due. Thank you for your note. I just changed it. Credit where credit’s due indeed. Ooh, and don’t worry about ‘asking permission to use a picture from your website’: I’ve just wiped out all your photos from my website.